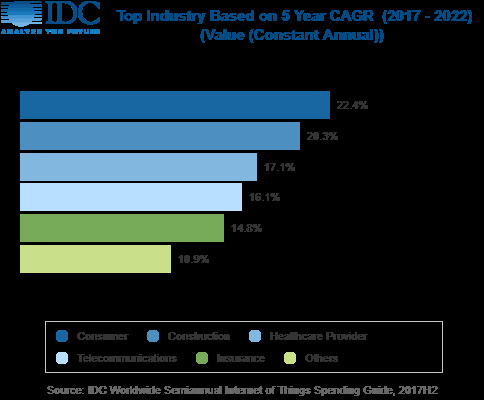 SINGAPORE, July 16th, 2018 – IDC Asia/Pacific released today the latest IDC Worldwide Semiannual Internet of Things Spending Guide Asia/Pacific (excluding Japan) (APeJ), which projects spending on the Internet of Things (IoT) to reach USD 291.7 billion in 2018, up by 12.1% over USD 260.1 billion last year. China will account for 64.2% of the overall spending ($187.3 billion) in Asia/Pacific (excluding Japan) in 2018 and likely to maintain its dominance with a five-year compound annual growth rate (CAGR) of 12.8% during the forecast period (2017-22). Adoption of IoT technology in other countries in the region are also steadily gaining ground, with Korea and India accounting for 9.8% and 8.8% share respectively of the overall technology spending in 2018. Use cases for manufacturing operations represent the biggest share of overall technology spending (17.7%) in 2018, and along with production asset management (5.8%), are largely driven by the adoption of industry 4.0 approaches. Freight monitoring has the second highest use case with 8.0% share of spending. Over the forecast period (2017-22), Connected Vehicles will register exceptional increase with a five-year CAGR of 33.8%. “In terms of market size by 2022, the top five industries driving IoT spending will be consumer, discrete manufacturing, process manufacturing, transportation and utilities with a combined share of 60% of the total spending in APeJ. The top five fastest growing industries, however, will be consumer, construction, healthcare provider, insurance, and retail. Connectivity will account for 20% of total spending in 2022, while services and software combined will account for 56.1% of total spending in 2022,” said Hugh Ujhazy, Associate Vice President, IDC Asia/Pacific. IoT Services is expected to be the market’s largest technology group with 28.9% share, accounting for $84.1 billion in 2018. Most of this spending is accumulated from ongoing services or 'Content as a Service' and, IT Installation Services. Software will be the second-largest technology group followed by Hardware and then Connectivity in 2018. From an industry perspective, manufacturing is expanding faster by installing new models of automation and analytical acumen with 31.9% share ($90.2 billion) of technology spending in 2018. Following this, the industries that are expected to spend the most on IoT solutions are transportation ($31.4 billion) and Consumer ($29.7 billion). However, Future of Consumer industry looks very promising with a five-year CAGR of 22.4%, whilst Construction and Healthcare Provider will register a growth of 20.3% and 17.1% five-year CAGR over the forecast (2017-22). “APeJ is the leader in WW IoT spending with the region accounting for more than 40 percent of the total worldwide IoT expenditure in 2018. Majority of IoT spending is likely to be generated in developing economies primarily driven by PRC and India," said Ashutosh Bisht, Senior Research Manager, IDC Asia/Pacific. The Worldwide Semiannual Internet of Things Spending Guide forecasts IoT spending for 14 technologies across 20 vertical industries in nine regions and 53 countries through 100 use cases. Unlike any other research in the industry, this comprehensive spending guide was designed to help vendors clearly understand the industry-specific opportunity for IoT technologies today.